See all the different sides of Japan…metropolitan glamour, inspiring spiritual beauty and natural grandeur…in 8 exciting days. From bustling, sophisticated Tokyo, to the foot of Mount Fuji, to the castles of Nagoya and finally to the serene and fascinating city of Kyoto, you’ll have the opportunity to savor the essence of Japan’s enduring allure. Arrive at New Tokyo International Airport (Narita Airport). You are welcomed and assisted to board airport limousine bus for your hotel. Note: If driveway up to Mt.Fuji's 5th station is closed in winter due to heavy snow, tour of Fujiyama Museum would be provided instead. 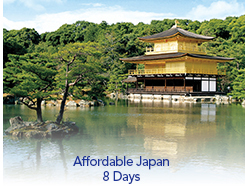 Morning enjoy your tour of Kyoto, visiting Golden Pavilion, Nijo Castle and Kyoto Imperial Palace. Afternoon board your train to Tokyo. Upon arrival, proceed to your hotel. * If Kyoto Imperial Palace is closed, the tour will visit Kitano-tenmangu Shrone instead. Days of Operation: Sun., Wed., Fri.